My husband John is spending his free time preparing to give several talks at the National Model Railroad Association convention in Sacramento California early next month. 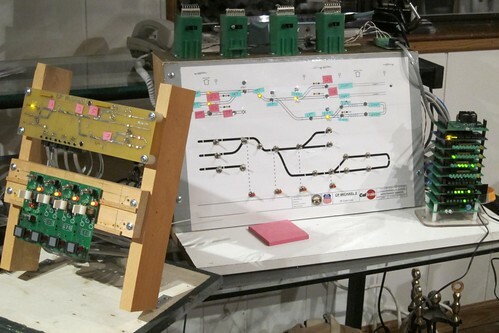 He has been working for months on a demonstration unit to support his presentations – showing what a model railroad would look like of it was designed and wired as a series of control points connected by a codeline instead of in the usual arbitrary, hodgepodge ways. (A codeline delivers indications from the field to the train dispatcher, and sends commands from the dispatcher to the field.) John models in HO Scale when he is not working on our “prototype” caboose WP 668 in the back yard. 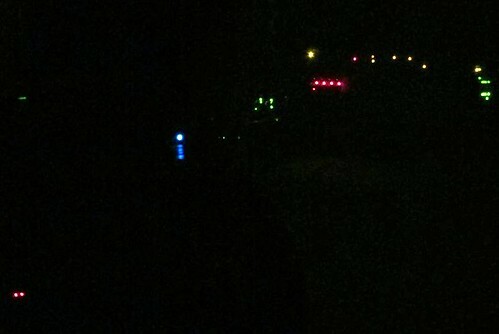 John’s project mostly looks like lots of blinky lights – especially when his office is dark. However, he tells me that this is state-of-the-art for model train layout wiring. 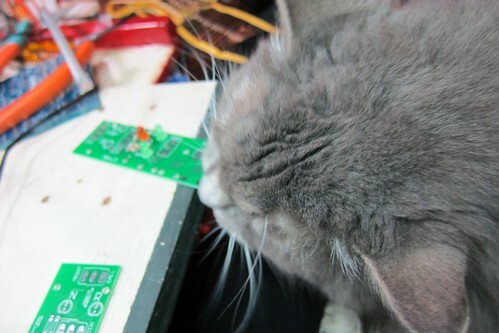 John is in a running battle with our cat Tino, who likes to chew on little wires and keeps sneaking in to disable the Arduino.